When visiting Malaysia, do not attempt to take on Malaysian street food with impunity; you'll be overwhelmed by the endless choices available to you. Visit any hawker center or noted food street (like Gurney Drive in Penang), and you'll encounter Malay specialties vying for attention among dishes concocted by other ethnic communities. The Peranakan (Straits Chinese), more recent Chinese immigrants, and South Indian Muslims who settled in Malaysia have all left their imprint via the Malaysian noodle dishes and Malaysian Indian food available from the country's many street stalls and hawker outfits. The flavors you'll find in Malaysia are totally unlike any you'll encounter in the West: cooks use local ingredients that combine sour, sweet, and spicy tastes in unique proportions. The foods on this list are available every day of the week, though the variety increases tenfold when holidays come around - Ramadan food and Peranakan Chinese New Year food can be enjoyed from pasar malam (night markets) wherever you go. 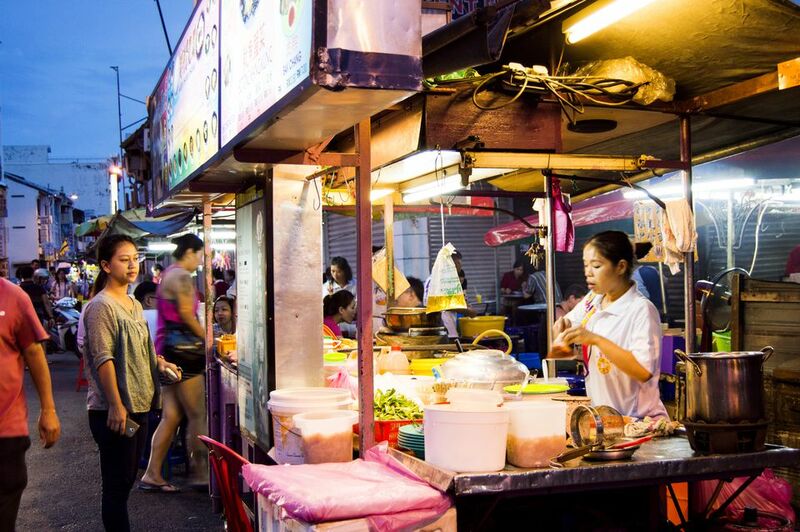 Particular cities, too, are renowned for their food, like the culinary scene in Penang, particularly the choices available in the old quarter of Georgetown. While laksa is a commonplace dish around Malaysia and Singapore, Penang's take on this beloved noodle soup dish sets it apart from the competition: the addition of assam (tamarind) gives the broth a tangy-sour flavor that will make you squint with delight as you eat your way through. Thick rice noodles make up assam laksa's starchy base; slivers of mackerel fish build on its flavor. Other herbs make their presence felt even before you tuck in, with the aroma of lemongrass, torch ginger flower and Vietnamese mint leaf wafting into the air from your bowl. But it isn't assam laksa until you add hae ko, or the fermented shrimp paste known in Malay as petis udang. The dish should then be garnished with finely-julienned vegetables and flaked fish. Some stalls serve extra garnishes like fish balls and hard-boiled eggs. The Peranakan - or assimilated Chinese of Malaysia and Singapore - invented assam laksa. Over the years, increasing public demand for this cheap and tasty meal has catapulted assam laksa into the ranks of the region's most popular foods. CNNGo.com recognized assam laksa as #7 on its list of the World's 50 Most Delicious Foods (source). Malaysia's Indian community have added their own cultural richness to the Malaysian culinary soup, and in Penang, this contribution comes in the form of nasi kandar. "Nasi" is Malay for rice, as white rice serves as the only constant for every nasi kandar meal. "Kandar" refers to a wooden or bamboo yoke that Indian street vendors used in the old days; they would balance a container of food on each end of the yoke, then sell their food on the streets carrying their merchandise. While the kandar has gone the way of the British colonial government, the foods remain, now served from stationary stalls or restaurants. Alongside their rice, diners pick and choose from an assortment of side dishes: beef spleen, beef cubes, fried sotong (squid), fried chicken, okra, omelets, bitter gourd, and eggplant. The dishes may either be piled on the rice or served in small bowls separately. There's practically no limit to the food you can choose from when eating at a nasi kandar place. As Penang author and food blogger Helen Ong explains, "The only limitation to what you will find will be the imagination and skill of the nasi kandar cook – some places can offer up to 50 different choices – and how big your eyes (or stomach) are, and of course how deep your pocket is!" The finishing touch is a helping of curry sauce, poured liberally on the rice (this is called banjir, or "flooding"). The city of Ipoh in the Malaysian state of Perak is surrounded by limestone hills. Those in the know say the limestone that created those hills affects the chemical makeup of Ipoh's spring water, which then improves the flavor and texture of the city's eponymous hor fun (flat noodle) dishes. This Malaysian noodle dish was created by the Chinese community in Perak, who are descended from Cantonese immigrants who imported their culinary distinctiveness into the Malay peninsula. When you order hor fun in Ipoh, you'll get a bowl of flat noodles drenched with a sweet chicken-and-prawn broth, then garnished with Chinese chives, shredded chicken, and prawns. Another gift to Malaysian cuisine from Hokkien immigrants from Fujian province in China, Hokkien mee (also referred to as har meen in Kuala Lumpur) is served in an infinite variety of preparations, but the Kuala Lumpur/Klang Valley and Penang variants are the most well-known in the country. Kuala Lumpur's take on Hokkien mee uses yellow egg noodles braised in a dark soy sauce. The result is a deep, ebony-colored sauce that is then enhanced with pork meat, squid, pork liver, prawns, lard croutons, and choi sum, along with a little sambal belacan for a spicy kick. The Penang version is cooked in a fragrant shrimp stock, with pork, chicken, and fresh shrimp added to the mix. The soup is then garnished with fish cake, pork ribs, squid, spring onions, shrimp and fresh lime. This communal hotpot, where diners dip skewers of raw food into boiling liquid, goes by two names, each one more popular in one particular city in Malaysia. If a friend invites you to try satay celup, then you should prepare to dip raw or semi-cooked food into vats of hot peanut sauce. If you're invited to try lok lok, then you're likely to be dipping those skewers in boiling soup stock. The former is more likely if you're in Melaka, the latter in Kuala Lumpur. The typical satay celup/lok lok stall or van offers a variety of meats for dipping: cockles, quail eggs, fried bean skins, meatballs, fish balls, kidneys, and prawns, among many others. Diners are charged by the stick. What you eat, and how much of it, is entirely up to you. "Half the enjoyment of Lok Lok lies in the DIY preparations (the other half is the eating)," explains RasaMalaysia.com's Bee Yin Low. "Once everyone is seated around the table, they pick out their selections and dip the skewered food into the pot and wait for them to cook.... Everyone talks and laughs amidst the preparations and that’s exactly the fun and art of communal dining." This savory-sweet salad is a Malay original: fruits and vegetables chopped into bite-sized pieces, drenched in a prawn sauce and garnished with crushed ground peanuts. Ingredients may consist of green mangoes, cucumber, bean sprouts, deep-fried tofu, and green apples. In Penang, they add squid fritters, guava, honey, while leaving out the bean sprouts and fried tofu. Don't be fooled by the fruity makeup of the typical rojak: the flavor tends to be more sour or tart than sweet. The whole dish is brought together by the dressing, which combines sugar, lime juice, chili, and shrimp paste: a medley of sweetness, sourness, and umami creating a unique taste experience. Pasembur - Make Mine the "Mamak Rojak"
Pasembur (along with its Chinese cousin, cheh hu) is related to rojak, but the ingredients are adapted to meet the taste requirements of a different community. Called "mamak rojak" after the mamak, or Indian food, stalls common around Penang, pasembur contains bite-size pieces of fried dough fritters, boiled potatoes, hard-boiled eggs, cuttlefish, tofu, cucumber strips, turnip, and prawn fritters. Everything is mixed up with a spicy peanut, chili and sweet potato sauce. Pasembur lends itself to experimentation - diners can add optional extras like sausages, whole prawns, deep-fried crab, squid, and fish cakes. You can also ask for the sauce to be served separately. The Chinese version of pasembur is called cheh hu, and uses a different sauce: a lightly spicy sweet potato and savory plum sauce, garnished with sesame seeds. The name cheh hu literally means "green fish", one of the ingredients of the original salad. The name translates to "Thai noodles", but surprisingly, "it doesn't exist in Thailand," writes food writer Denise Fletcher, author of Mum's Not Cooking: Favourite Singaporean Recipes for the Near Clueless or Plain Lazy (compare rates). "The closest thing you will find to it in Thailand is something called 'Mee Kati', made with similar ingredients, but with the addition of coconut milk, and presented and served differently as well." Name aside, mee siam was invented by the Peranakan: thin rice vermicelli noodles stir-fried in tamarind, rempah (spice paste) and tau cheo (soybean paste), then topped with salted soybeans, hardboiled egg, dried beancurd, shrimp, chicken, shredded omelet, and spring onion. The spice mixture creates a spicy/sour/sweet taste that can't be found in any other Malaysian noodle dish. As far as noodle dishes in Malaysia go, char kuey teow ranks among the richest in flavor and aroma. Flat rice noodles are stir-fried in soy sauce with spring onion, bean sprouts, prawns, cockles, and Chinese sausages. The cooking is done in a Chinese wok over high heat; the technique imparts a smoky aroma to the dish called wok hei (literally "breath of wok" in Cantonese). Char kuey teow is often cooked in individual batches, allowing the noodles to absorb the soy sauce and seasonings completely. Deluxe versions of char kuey teow incorporate garnishes of mantis prawns or crab meat. Food buffs recommend you go to Penang to get a taste of authentic char kuey teow. Traditional sellers make this dish over a charcoal stove, which some believe adds to the flavor. This coconut-infused rice dish is called the unofficial national food of Malaysia. Originally served as a breakfast dish, nasi lemak is now served at any time of the day, with endless regional variations. Every nasi lemak consists of rice steamed in coconut milk, which imparts a creamy texture. The rice is served on a banana leaf (or a plastic plate sculpted to look like a banana leaf!) alongside a dab of spicy sambal, a small pile of deep-fried anchovies (known to locals as ikan bilis), roasted peanuts, cucumber, and sliced-up hard-boiled egg. The basic configuration accommodates additional foods such as cuttlefish, chicken, cockles, beef rendang, and pickled vegetables (achar), among others. In Indonesia, a similar street food is served as nasi uduk. A Malaysian Peranakan version of nasi lemak is served with assam prawns or fried assam fish (assam refers to the meats being cooked in tamarind). The Malaysian Indians like their nasi lemak served with curry. Malaysian diners in a hurry can order nasi lemak to go in packets called nasi lemak bungkus. In the old days, diners called this Malaysian noodle dish "tok tok mee", after the sound made by the vendors' knocking two bamboo sticks together to advertise their presence. Today, this one dish is spelled in many different ways, but wherever you find "wonton", "one ton", "wan thun, "wan tun", or "wan than", you'll find the same thing: springy thin egg noodles topped with Chinese kale (kai lan), sliced roast pork (char siu) and wonton dumplings stuffed with prawn and minced pork. Like many of the dishes in this list, wonton noodles lend themselves to endless variation. The "dry" version uses cooked noodles tossed in dark soy sauce with lard and shallots. The "wet" version is drowned in a pork or chicken stock. But it doesn't end there. Do you want your wonton boiled or deep fried? Do you like your noodles fine or thick? Do you like 'em with sambal? Soup on the side, instead of over your noodles? Johor has its own version of wonton noodle, as do the states of Sarawak, Selangor, Perak, and Pahang. You'll probably find all these varieties (and more) in Penang, the state with the most developed food scene in Malaysia. Do You Know How to Eat Malaysia's Iconic Noodle Dish?